This was in Dizzy Dishes, a cartoon which was part of the Talkartoon series. 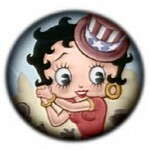 The ‘fully human’ Betty Boop didn’t come out till 1932 in Any Rags, another animated cartoon. All except one of Betty Boop’s theatrical appearances have been black and white. Her only theatrical color appearance is in Poor Cinderella in 1934.